It grates against our ears to hear the number given as five thousand and then to be told that the women and children weren’t counted. It should, I guess. It is helpful to remember that equality of men and women – and adults and children – is not part of our human experience ever since we lost the garden. (We should be clear that scripture attributes this to our fall from communion with God, and not to God’s eternal design.) But it wouldn’t have sounded strange to Matthew’s congregation; it would have said something much different to them. First of all, it would have clued them in that we are hearing about a banquet. Banquets at the time were public rituals not private parties. As public events they were the affairs of men. The fact that this is a banquet is important for Matthew, because he has set this banquet of Jesus alongside the banquet of Herod Antipas. This is a banquet, a public occasion, not a spontaneous picnic in the park (at the time of Jesus, people didn’t picnic out in nature). At such occasions, the food was set before the men, what remained would then be taken away to be shared with the women and children. (It was a man’s obligation not to eat to excess, to remember that others would need to eat from this table.) After the women and children ate, what remained would be shared with the poor. (So it was also the obligation of the women and children not to over indulge. Whatever they ate beyond what was needed was stolen from the mouth of the poor.) So this simple reference “those who ate were about five thousand men, besides women and children” clues the reader in that what happened out there in the wilderness was not as a quick lunch but the banquet of God. At this banquet of God everyone ate and was satisfied – and there were still twelve baskets left over, twelve baskets for the poor, twelve for the twelve tribes of Israel. All are fed at the table of God. All are fed. Not those in power. Not those with privilege. Not those with abundant lands. Not those with houses and fields and people to come tend their gardens and clean their houses and prepare their meals. All. The men, the women and children, and the poor. 5,000 was bigger than all but a few cities in Israel. 5,000 households may be hyperbole – but it proclaims the bounty of God. The banquet of God has come to us in this Jesus of Nazareth. Israel is fed again in the wilderness. The nations are gathered to feast at Zion. The reign of God is present to us in this blessed and broken bread. 19Taking the five loaves and the two fish, he looked up to heaven, and blessed and broke the loaves, and gave them to the disciples, and the disciples gave them to the crowds. Do you think the disciples ate first, before passing the food on to the crowds? I wrote this simple question for Friday’s reflection. After writing the question, I couldn’t find the next words. I tried. I tried several times. And every time, it seemed like they were just words, that all the power was in the question. But I was unwilling to post just the question. I wanted people to probe the depths of the question. In a way everything hangs on this question: Is the church’s first obligation to feed itself or to feed the crowds? This isn’t meant to be a stick with which to beat upon our congregations (it’s not that we don’t deserve it; it’s that beating us with sticks doesn’t make us more loving.) It’s meant to be one of those simple incisions that open us up for heart surgery. Hiding in the question is the reminder and profound truth that Jesus didn’t eat first, either. He didn’t eat first on the night of the last supper; he got up and washed everyone’s feet. He didn’t eat first when the soldiers came to arrest him; he stepped forward so his followers could get away. He didn’t eat first – he didn’t take care of himself first – when he stood before Pilate, or when he carried his cross, or when he bore our pain. Alright, maybe he ate first on Easter evening when he appeared to his followers and asked for something to eat, but that wasn’t to serve himself, it was to show his disciples that he was not a ghost. That night he ate first for our sake, as everything else was done for our sake. Jesus gives himself to us and for us. And when we understand this, when we are truly grasped by this faithful love of God, then we start to understand that the meal doesn’t end with us: we were sent to feed the crowds. 13Now when Jesus heard this, he withdrew from there in a boat to a deserted place by himself. But when the crowds heard it, they followed him on foot from the towns. “When the crowds heard it.” The ‘this’ Jesus heard was the beheading of John, but what is this ‘it’ that the crowds heard? Does Matthew have in mind that the crowds have also heard about John? Or does Matthew have in mind that the crowds heard have that Jesus has gone to a deserted place? Translating is tricky work. It would be nice to have the translator before us to ask why he or she translated the Greek word ‘and’ with a ‘but’. The ‘and’ seems to suggest that we are extending the thought – Jesus withdrew and the crowd went after him. The ‘but’ raises the possibility that Jesus’ response to John’s death was to withdraw, but the crowds’ response was to follow Jesus. ‘Follow’ is a big word in the Gospels. It is what disciples do. Is Matthew suggesting that the crowds that had looked to John now look to Jesus? That the mantle of John has fallen on Jesus? It’s not uncommon when we lose one hero to look for another. So are the people looking for a hero, any hero, or are they looking for Jesus? Are they turning to Jesus out of desperation or have they found the one and don’t want to let him out of their sight? Do you see the question that is homing in on us? Are we people who turn to Jesus in moments of crisis, or have we found in him the word of life and want always to be in his presence? Are we following him or leaning on him? Is he the plumber we call in an emergency or the master to whom we have apprenticed ourselves? It is an important question for our self-reflection. Are we dilettantes or disciples? The sweetness in the text is that it doesn’t matter to Jesus. When he sees the crowd, he has compassion. He does not ask if those who have come with their sick are there just for the healing or for the whole journey of faith. He heals. He nourishes. He sets before them the great banquet of heaven. Not too far down the line, one of Jesus’ closest disciples will betray him and the rest will run away. Peter, too, will choose his own skin – thought none of us can honestly blame him considering what happens to those who would suggest there is some other rule on earth than Rome. But the question whether Jesus is a vocation or an avocation will haunt Peter until Jesus walks him back through his three-fold denial with a three-fold declaration: “Yes, Lord, you know that I love you.” But even that morning, on the shore of Galilee, began with a meal. Jesus will indeed talk to us about the necessity of discipleship. But first there is compassion. First he heals. First he sets before us the great banquet of heaven. 13Now when Jesus heard this, he withdrew from there in a boat to a deserted place by himself. “When Jesus heard this.” The reading for Sunday requires us to look back and see what the “this” is. “This” is the beheading of John. You have probably heard of this “this”. It was made famous as the “Dance of the Seven Veils” in Richard Strauss’ opera Salome. 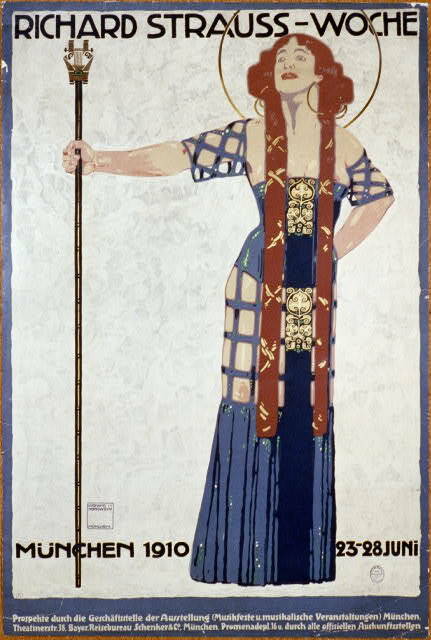 Salome is the daughter of Herodias from her first marriage to Herod II. His brother, Herod Antipas, scandalously took Herodias as his wife against Biblical law. (Herodias divorced Herod II when he was dropped from his father’s will, perhaps for someone still in line to inherit the throne. To take Herodias, Herod had to divorce the daughter of the Nabataean king. This led to war with the father of the spurned wife.) John dared to preach against the illicit union and Antipas eventually had John arrested. He was, however, hesitant to kill the prophet. Herodias apparently had no such compunction towards the prophet who called her marriage incestuous. And, according to the Biblical account, at a great palace banquet for his birthday (attended only by men, remember) Antipas allows his daughter to dance for their entertainment. It is shameful to allow a family member to dance before men who were not family. And it is yet more shameful to show oneself aroused and out of control by such a dance. But Herod – again shamefully – promises her anything, up to half his kingdom. Salome consults with her mother and returns to ask for the head of John. Herod is bound by his public oath and has the head of John brought on a platter and given to her. The feasts of the elite were decadent affairs by almost any standard, made more so by the progressive impoverishment of the poor who were losing their lands to the wealthy. 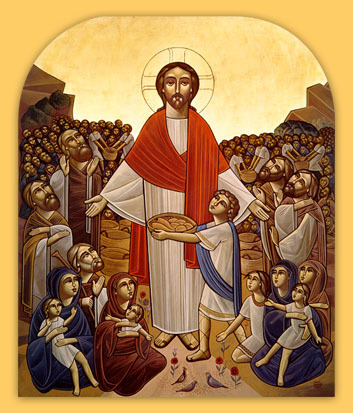 Against this background we see Jesus hold a banquet that feeds the poor. When Jesus hears about the death of John – his cousin according to Luke – he leaves town. Whether he is avoiding Herod, troubled by grief, or on a spiritual retreat to ponder what John’s death portends for himself, the text doesn’t say. Only that the crowds followed, raced around the lake, and were waiting for him when he got off the boat. Though he sought solitude, he had compassion for them and began to heal their sick. As the day grew late, he is urged to send the crowd away. The five loaves and two fish are not, in Matthew’s telling, brought forth by a small boy; it is all Jesus’ disciples have. But placing their all into the hands of Jesus, it becomes enough to satisfy the whole crowd. Herod serves a banquet leads to death. But in the wilderness, Jesus serves a banquet that leads to life. Church of the Multiplication in Tabgha, Israel. 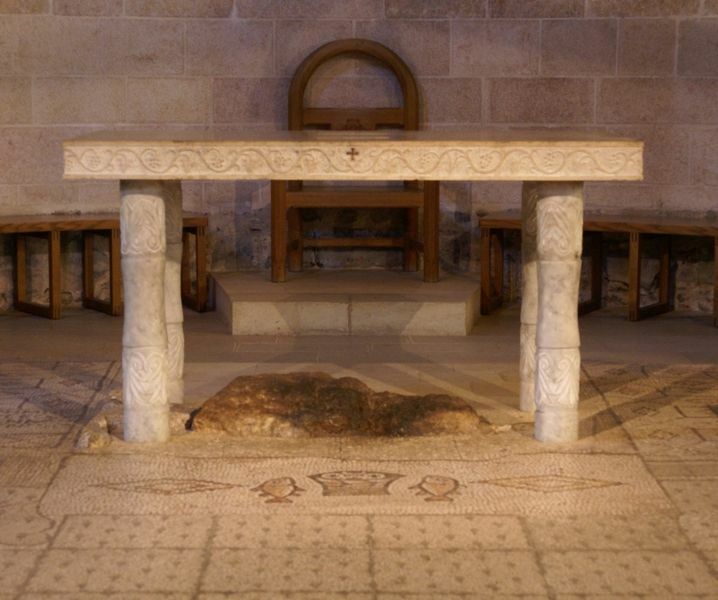 The mosaic on the floor marks the stone where Jesus was thought to have multiplied the loaves and fishes. The mosaic is from the fifth century church destroyed in 615, but rediscovered and excavated in 1892. Manna in the wilderness, the bounty of creation, the banquet of God towards which all creation moves, the table of the Lord around which we gather every Sunday – they all weave together in the readings for Sunday. The central narrative on Sunday is the feeding of the multitudes. 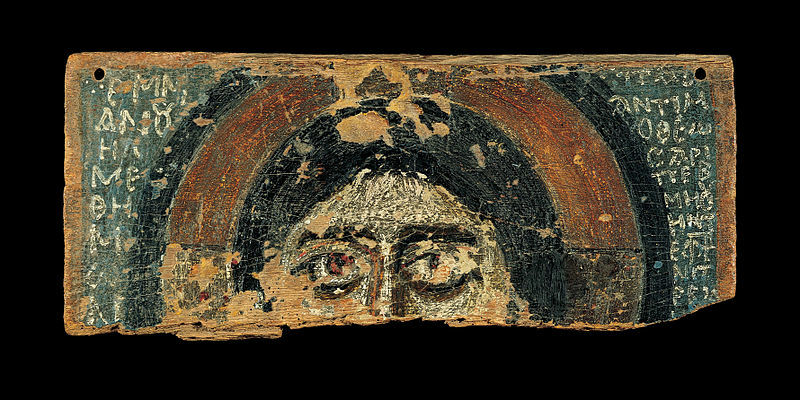 It is perhaps the single most important story in the Gospels other than the passion. It is told by all the gospel writers – and by Matthew and Mark twice: feeding 5,000 and then again 4,000. We have lost something of the meaning of family dinner. It lingers on for many in the celebration of Thanksgiving. We almost always seal a wedding with the sharing of a meal. We know that the sharing of food binds us to one another. It is the most fundamental of all acts of human kindness. I have a picture of my first born in a high chair, learning to feed herself, offering us a cheerio with her gummy fingers. Food is to be shared. It binds a mother and child in the most intimate communion. It binds God and ourselves in the most intimate communion. God the provider. God the eternal parent who gives his life for his children. God the prodigal father who kills the fatted calf to bind together a fractured world. So the prophet cries out like a merchant in the marketplace bidding all to come and “buy” the sustaining food offered at God’s stall for free. So the poet sings of God’s open hands to provide his bounty for all living things. So Jesus takes the five loaves and two fish and provides the Sabbath meal for all creation. And even Paul’s passionate cry that he is willing to be eternally cut off from God that his people might receive God’s gift in Christ Jesus, reflects that eternal love that comes to us in the bread and wine. Picture of the mosaic noted above. The Church’s act of communion is not a religious ritual; it is the most profound participation in Christ. We who eat this bread are present in the wilderness receiving the manna. We who share this loaf are transported to the hillside with the five thousand. We who gather together at this table are given a taste of the wedding banquet that has no end. The world to come has come in Jesus. Lives are healed. Sins are forgiven. The estranged are reconciled. The dead are made alive.